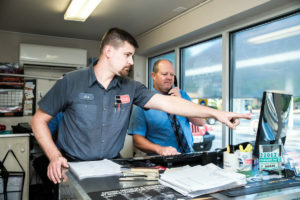 Joe Hearn, the lead technician at AutoStream Car Care in Ellicott City, won an All-Star Award presented by a well-known automotive industry publication Ratchet + Wrench. Joe is our two time Technician of the Year. He has seven ASE certifications. He is a Maryland State Inspector. He is dealer certified through Acura. He has taken numerous online NAPA courses. He has attended multiple local training classes. He can work on all makes and models. He has knowledge of many industry-leading tools and is proficient in several of them. These are all of the qualifications that make Joe Hearn deserving of an All-Star award. We are proud to have such a knowledgeable and driven technician leading our 5-location repair shop. Technicians like Joe are the reason we are able to provide customer-first service and quality vehicle repairs. His knowledge and ability to work on all makes and models offers our you, our customers, top-notch service and repairs. Like you, Joe is also a member of the community we serve. He is married and the father of two. He coaches his sons basketball team. His dedication to family shows through his dedication to our AutoStream Car Care family. He is a team player and tremendous resource AutoStream Car Care. We are proud to have him our our team! Next time you stop by our Ellicott City location, make sure you say hello to Joe Hearn and congratulate him on winning this distinguished award!